It’s almost like lightning struck twice. 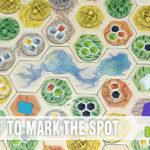 We’ve seen a lot of unique board game themes over the years and occasionally run across one that is unique, at least to us. Such was the case a couple years ago when we discovered Lift Off! Get Me Off This Planet! The first issue by then-new Pencil First Games (also known for their popular card game, Herbaceous), Lift Off! had you taking on the role of an alien trying to escape from a planet that was about to explode. At the time we lauded the fact that we had nothing like it in our collection. Little did we know we’d discover another game with a similar theme. 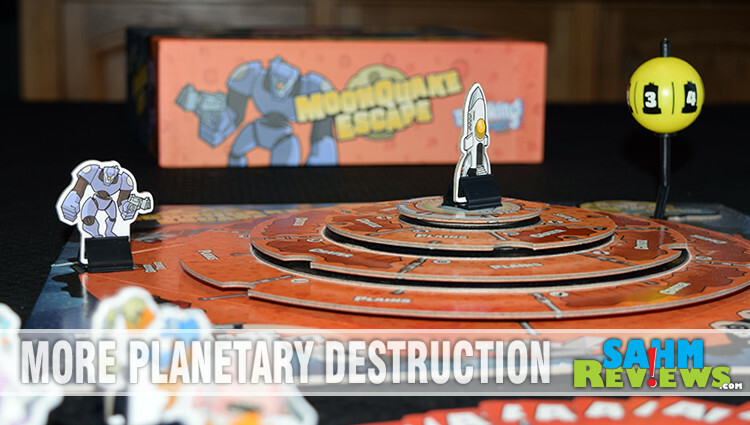 We initially came across MoonQuake Escape at Breaking Games‘ booth at last year’s Gen Con convention. It was being prominently demonstrated and one could not miss the unique three-dimensional board with spinning rings and a hovering plastic moon spinner! Just the visual appeal meant it was destined to go home with us. 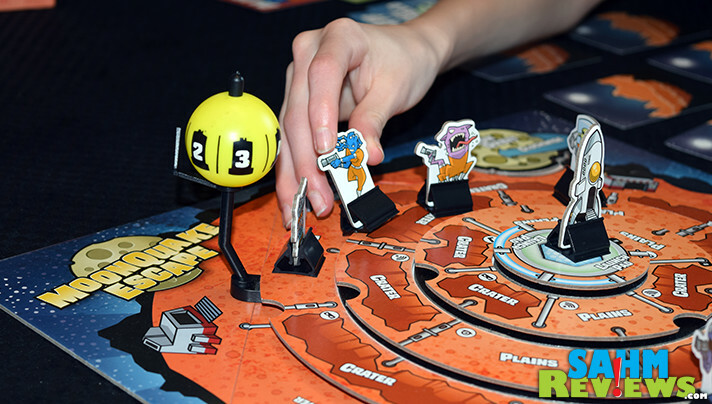 Designed for up to six players, each person takes on the role of an imprisoned alien trying to escape the remote planetoid of Zartaclaton. When the prison was built, engineers overlooked the fact that the planet had an unstable molten core that was being affected by the gravitational pull of the planet’s moon. A giant MoonQuake occurs and frees you from the prison. But you soon realize that what freed you will also soon destroy the planet. And there’s only one rescue rocket left! You must be the first to reach the rocket and propel yourself to safety! 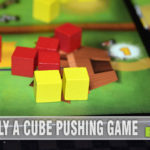 The 3-D board needs to be assembled and has options for two different levels of difficulty. Pipes act as guides to help you keep the rings aligned. 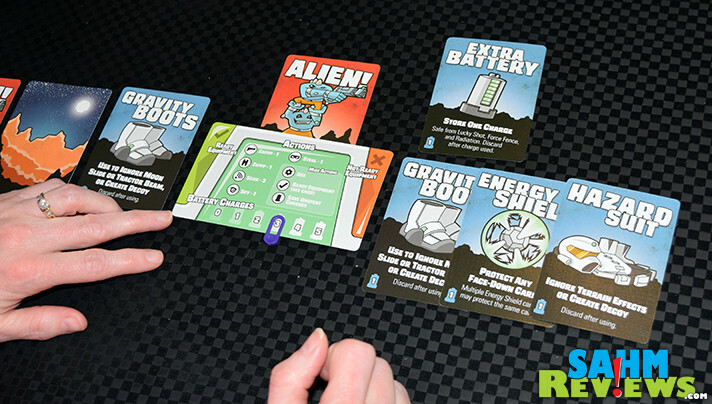 All players receive a status card with a slider to keep track of their energy, a pair of alien cards with matching standee, an Energy Shield and four randomly-dealt cards. Any Equipment cards received are immediately placed to the right of your status card in the “Not Ready” area, and the rest are laid face-down in front of you with your Alien card mixed in. You may now use the Energy Shield to protect a hidden card by placing it on top of one of them. To escape the planet you simply have to be the first to make it to the center of the rings. Sounds simple, but there are a number of possibilities that will hamper your efforts. The hovering moon spinner also denotes first player. After each round it will pass onto the next person in order. However this moon can change orbit, effectively reversing the turn order for the next round. 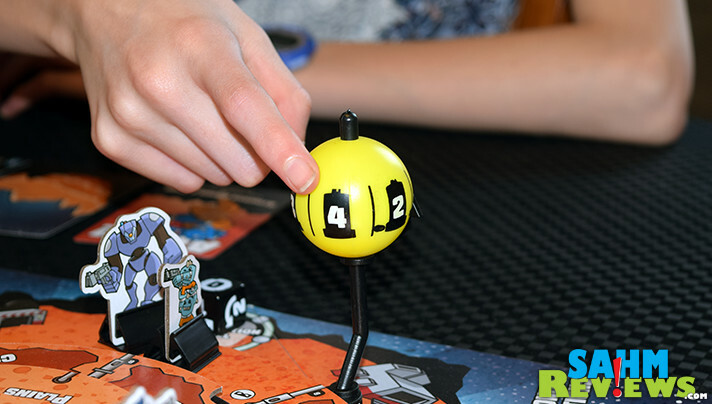 At the beginning of each round in MoonQuake Escape, the first player spins the Moon Spinner and each person adds the result to their status card, capping out at a maximum of five. There are also Lunar Eclipse and Lunar Glow cards that may be played that will lock in certain charge amounts, negating the need for a spin. The first player also rolls the Quake die once for each board ring in any order. The die result will tell how many spaces a ring will rotate and in which direction. Any aliens on that ring will move with it. After the board is set, the second phase of the round commences. If your Alien card is still face-down in front of you, you will move your standee to one of the two spaces on the next level up that touches your current space. If one of the spaces is a crater and you began on a regular plains space, you will move to the other. If both are craters, you may choose which to move into. If you were already in a crater, there are no movement restrictions – you may move into either type equally. There are also cards (equipment, etc.) that may allow you to land in a crater or force you to slide into one. You may only move if your Alien is hidden. If your Alien card is face-up, you must spend your turn hiding him again by drawing three additional cards, placing any equipment received next to your status card and then mixing the rest with your Alien card and any others in your hand and protecting them with Energy Shields, if available. As the third phase of a round in MoonQuake Escape, all players get to spend their energy charges on their status card to try to uncover other players’ Aliens. Spend one charge to Zappp an opponent, turning over one of their face-down cards or defeating their Energy Shield. A Zappp can also be used to dispatch the prison guard to the Guard Tower. If the Alien is exposed, it is left face-up. Otherwise the exposed card is resolved immediately and can affect either player, depending on the card. Zippp, also one charge, lets you move around your current ring up to two spaces away, keeping in mind the restrictions for moving into/out of a crater. You can also spend charges to ready equipment for use, paying the cost on the card. Using readied equipment is free and can be done so immediately after paying the fee to ready one. Three charges can be spent to add a card to your hand from the deck, one charge to peek at a single face-down card of an opponent and one to steal another player’s unready Equipment card. 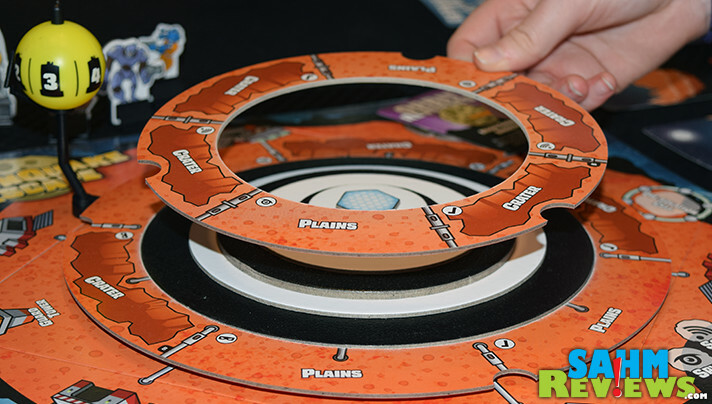 Additionally, each space on the board has a bonus action that costs nothing to use. You gain the action of the space you are on at the beginning of the phase and it can be taken at any time. The last round phase is centered around the prison Guard. If no aliens are on the same ring as the guard, the first player moves the Guard to any space on the next higher ring and ends the phase. If there is at least one alien on the same ring, the Guard does not move. Instead the Guard Zappps players (in turn order) with the next player acting as the Guard and Zappping the previous player. Exposed cards do not take affect, they are simply discarded. Discovered aliens are revealed and remain face-up! To win at MoonQuake Escape you must have your standee on the launch pad at the end of the round. Your Alien card must also be hidden and you must have at least one charge left on your status card to power the rocket. If you fulfill all three requirements, you escape the planet and are declared the winner of MoonQuake Escape! Once you have mastered the basic game, turn over the rings and play with additional terrain types like Ion Storms, Radiation and Tractor Beams. Additional advanced rules give bonuses to craters by introducing line-of-sight (you can’t be Zappp’ed if in a crater) and allowing you to hide your equipment, making finding your alien a bit more difficult. Either version of MoonQuake Escape can be played in under an hour, with the advanced version probably lasting a little longer than the basic since you’ll need to think about your strategy and positioning every turn. While advertised for ages 10+, we can see this being enjoyed by the 7+ age range as long as there was a parent around to explain the rules. Copies are on Amazon for under the $50 MSRP or direct from Breaking Games on their website! And as always, make sure you’re following them on Facebook and Twitter as they make announcement of their new releases for the summer! So Mr. (or Mrs.) Alien, what did you do to get sent to this prison? What Do Aliens, Siblings and Gems Have in Common? Are You Prepared for the New Alien Movie? This sounds like a great game to play as a family. I like the different story line and 3D playing board. This game looks like tons of fun! I like how it goes in a ring and that’s how the game follows from start to finish! What a cool name for a game! 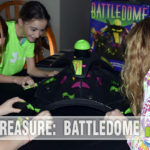 Seems like a blast – lots of ways to make this a fun game for family night! 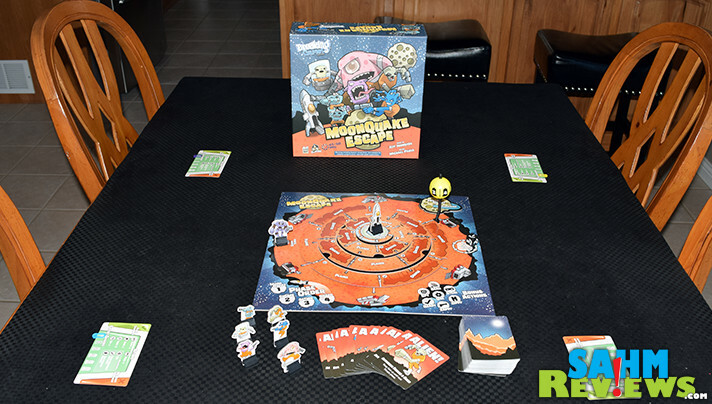 I think MoonQuake Escape would be a great game to play with the kids. I am always looking for new rainy day ideas. It is a great gift idea as well. 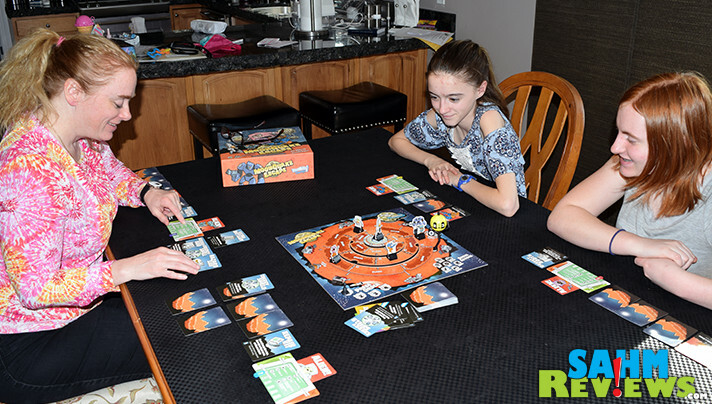 We love board games in our house and I bet my son would flip over this game! Will have to check it out asap! 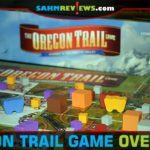 We need to check these games out! They are perfect for family night. You always share the greatest games. I like to try out new games for game night. This looks like such a cool game! I think my daughter would love this. I know some kids that would love this game for all kinds of reasons! It looks like the type of game that would be fun as they age too. Very cool.